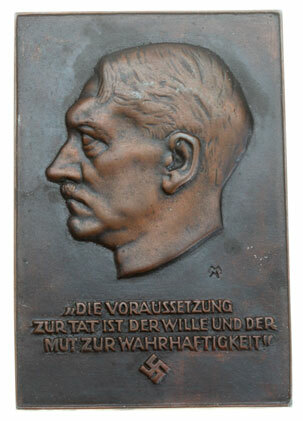 The Fuhrer Plaque: was an officially recognized NSDAP non-portable award. It was presented to middle ranking political and state officials in recognition of special achievement. 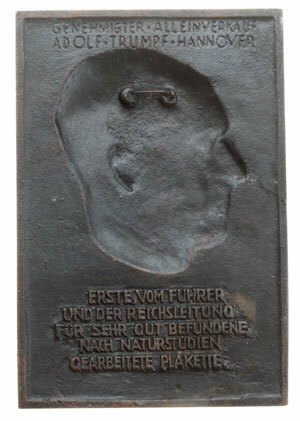 Unlike most non-portable awards, this one was made so that it could be hung on the wall of an office. Copper plated feinzink with a dark antique finish, 92 x 138 mm (3.7 x 5.5 inches); maker Adolf Trumpf of Hannover; light wear, hard to find this nice! "Die Voraussetzung zur tat ist der Wille und der Mut zur Wahrhaftigkeit" (The prerequisite for doing is the will and courage of truthfulness).